Daily Mirror - Depression moving towards Arabian Sea: Met. Dept. Depression moving towards Arabian Sea: Met. Dept. As the depression to the South-west of Sri Lanka is now located around 550km away from Colombo and likely to move towards the Arabian Sea, its effect to the country will gradually decrease, the Meteorology Department said this morning. The Department said that several spells of showers would occur in the Northern, Eastern, North-central, Uva and Southern provinces while showers or thundershowers may occur elsewhere after 2.00pm. According to the Weather Report issued at 5.30 am, the Department said that fairly heavy rain falls of about 75mm are expected in some areas, particularly in the Vauniya, Mannar, Puttalam and Kurunegala district. Fairly strong gusty winds of up to 50 kmph could be expected particularly over the North-Central province and the Galle district. 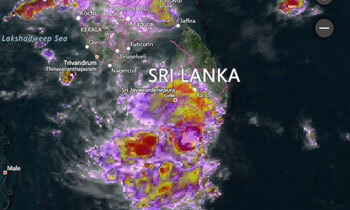 Meanwhile, the Natural Hazards Early Warning Centre of the Meteorology Department said that there is a possibility for heavy showers or thundershowers and rough seas due to the sudden increase of wind speeds of up to 70-80 kmph in the deep sea areas off the coast extending from Puttalam to Matara via Colombo and Galle. warning incoming jokes about depression.